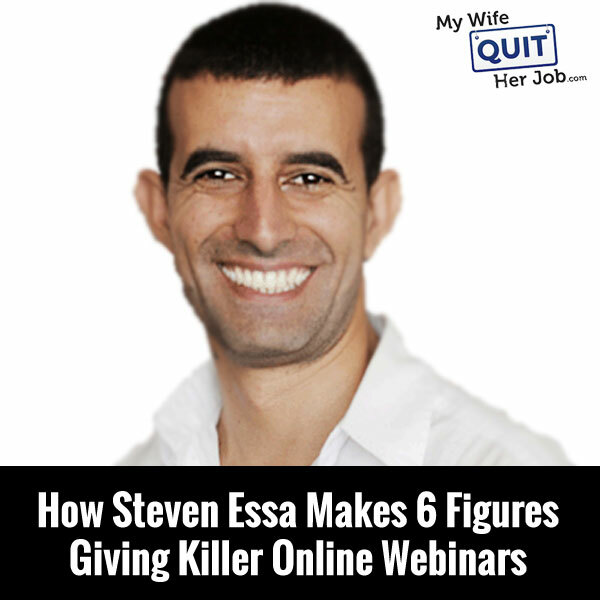 This podcast episode with Steven Essa was one of my favorites because I learned so much about the art of giving effective online webinars. Seriously, this episode was so jam packed with actionable tips that I found myself furiously taking notes during the interview. In fact, Steven was so engaging that I barely spoke at all and he did most of the talking. He’s got tremendous energy and I know that you’ll get as much out of it as I did. Enjoy! Should you give away your best stuff in the webinar? Steve: You are listening to the My Wife Quit Her Job podcast where I bring in successful bootstrapped business owners to teach us what strategies are working and what strategies are not. Now this isn’t one of those podcasts where we bring on famous entrepreneurs simply to celebrate their success, instead I have them take us back to the beginning and delve deeply into the exact strategies they used early on to gain traction for their businesses. Now if you enjoy this podcast please leave me a review on iTunes and enter my podcast contest where I am giving away free one on one business consults every single month. For more information go to www.mywifequitherjob.com/contest and if you are interested in starting your own online business, be sure to sign up for my free six day mini-course where I show you how my wife and I managed to make over 100K in profit in our first year of business. Go to www.mywifequitherjob.com for more information. Now onto the show. Welcome to the My Wife Quit Her Job podcast. We will teach how to create a business that suits your lifestyle, so you can spend more time with your family and focus on doing the things that you love. Here is your host, Steve Chou. Steve: Welcome to the My Wife Quit Her Job podcast. In this episode I’m going to be talking to Steven Essa. Now the reason why I decided to bring Stephen on the show is because I wanted to interview someone who makes a living with webinars. Now Steven is actually recognized as one of the leaders in the webinars niche, and today he speaks at major online business events, internet marketing events around the world and teaches people how to animate their webinar processes. Now here is what I like about Steven, he is a hustler. The guy started out with no money at all when he was a heavy metal rocker, then he went through a bunch of jobs deep in the trenches like being telemarketer, a maintenance man, network marketer until he found his calling with webinars. Now personally I actually don’t have a lot of experience with webinars so it will be a real treat to learn from the guy. So with that, welcome to the show Stephen. How are you doing today man? Essa: Yeah, great Steve. Thanks for having me on man. Steve: Yeah, great to have you. So give us a quick background story in case people haven’t heard you before, and tell us about your business and how you got started with webinars. Essa: Yeah, absolutely man. I think, you know, I was always been searching for a way to achieve financial freedom since I read Robert Kiyosaki’s book, “Cashflow Quadrant” in the year 2000 when I was banging my head up against the wall in a job doing telephone sales for a company in Australia here, and at the same time I was in band trying to make it in the music business. I had a dream of one day performing some big shows and all that and he worked very-very hard in the music business for 13 years which taught me a lot of business, taught me a lot of networking and the importance of marketing yourself and all of that stuff. So we took that as far we could, we ended up in Los Angeles in 2003 to 2005, and they said, you know, it’s the worst time ever for music. So I just got really-really frustrated and said, “Well 13 years and now it’s over?” So it’s like– it wasn’t a very good plan. So I basically said to myself, “I’m going back to Australia where it’s nice and relaxed and it’s not as superficial, not as superficial as Hollywood.” And I basically just started to focus on creating a business and investing in real estate. And I tried to build a website, and I’m not a techy at all, so I think I had one meeting with a guy and that was the end of that business, and then I went into real estate and I started buying property and in 2008 pretty much got wiped out like many people who are highly leveraged. So I thought– I went back to the Robert Kiyosaki book, I read eight years earlier and he said, “Build a business and invest in real estate.” So I was trying to invest in real estate as a business and I said, “Well I don’t want to go and buy a franchise and spend all this money or rent a store. And I have to basically pay for all that expense and I got no idea how to run a business.” So I looked online because online is cheap, it’s a cheap place to fail. And he said, “Look to fail as many– he said, ‘One in ten businesses makes it, nine out of 10 fails.” So he goes, “That just means you have to try 10 times.” And I thought, “Well I don’t mind trying 10 times if it’s online because most you’ll spend is a couple of grand.” And that’s what I did. So initially I was working in a real estate job and I looked to help my boss’s business with his internet marketing. And it’s what I always tell people Steve is if you have don’t have a business right now, go and apply these stuff that we’re teaching and that you teach and your other experts teach. Go and apply it to someone’s business because one of my favorite mentors when I was growing up was Bruce Lee. I read in many of his books and he says in his book, “Knowledge is not enough. We must apply what we know, otherwise it becomes lost.” And I went to internet marketing events and read books and started applying that to my boss’s business because I didn’t have a business. And I helped him make like 106 grand in sales using the presentation techniques I was learning and the copyrighting and all that sort of stuff, and it gave me confidence. I said, “Wow! I can do this for myself. If I can do it for him, I could do it for myself.” So I quit my job in 2008 and I started my own business at that point. And I said, “No one is going to pay me to do webinar and teach him how to do webinars because they are so easy, right?” Who would pay to learn how to do– all you got to do is press record, have a PowerPoint presentation, and start talking. He said, “No, you’ll be surprised.” And eight million dollars later, it’s like– and five years down the track, he was right. It’s like it’s found a niche for me and I became the webinar guy. Steve: So today you actually go around the world teaching people how to make money with webinars, is that right? Essa: Yeah, that’s right exactly. We did a world tour. My wife and I– we said, “What’s the ultimate?” We really-really are passionate about helping people achieve financial freedom and achieve– get their message out there. Many, many great experts have great knowledge but they are working one on one in their business or their practice and they don’t have leverage. So unfortunately they are going to die with their information in them when many people around the world could benefit from that information that they share. They could have a healing modality that no one knows about, that they could help people heal and there is all sorts of people that can cure cancer and do all these sorts of things that are amazing, but they are stuck in their little local town and they are very busy in their business, and they don’t have time to actually implement any of this. And I teach people to– who is an expert how to leverage but also teaching other people to go these experts and help them set up a webinar business because they can get their information online and out there and they can pay you 50% for doing it. And that’s sort of what I do now– is I have business partners that I just control the backend, control the webinars and I own five companies now that are doing anything from 5 to 50 grand a month. And also we do is teach the expert how to present on a webinar, how to sell and leverage them. Steve: Okay. You know, we are going to go through that in a lot more depth in today’s interview. I just thought I’d make a couple of comments. So one of the reasons– so I’ve done a couple webinars in my day and one of the reasons I don’t like to do them very often is because I got to prepare a really good presentation and a lot of times it’s one off thing, right? And so what I understand is you actually offer this software that allows replays of the webinars, right? So can you kind of comment on how that works? Essa: Yeah absolutely. If you’re going to be doing the work you want to leverage it right. So you want to create a webinar presentation, run the webinar live, it forces you to actually do it and record it. And once you’ve recorded it– it’s not just my webinar software, there is many people who have webinar replay softwares out there that will automate your webinar. Mine is just one I created for myself, then customers started wanting it, so I made it available to my members and we sell it online, but basically it just allows to replay your webinar in one of many forms. You can have it as a video that’s like people can watch the video and then when you say buy now, a buy now button can drop down and they can click on it and buy and that’s how you make money while you sleep. And then there is also scheduled replay webinars which allows them to watch it, but they can’t fast forward or rewind it, so it has a bit of a live field to it. Now when you’re marketing replay webinars to people, don’t say it’s a live webinar if it’s not, because deceiving and I think people these days will– you don’t want to blow your credibility in terms of saying, you know it’s a live webinar when it’s not. Steve: So you actually have to schedule it, even though it’s a replay you still have to schedule time to watch it? Essa: There is one of three options, that is what I was going to say now. To be honest I just allow people– I have a play anytime option, I just let people watch it anytime. But I removed the control so they can’t fast forward and rewind because a good webinar presentation is a process that people need to go through in order to get into the buying frame. They need to see each section. And when I do, when I help people put together a webinar whether it’s at one of our events where we pick someone out of the crowd and do it from scratch or whether it’s one of my 75 grand clients– I go through the same process. It’s the same template; our templates that we’ve created, they’ve probably done over $50 million in sales for us and our clients that have used them, so it’s a proven formula. I just have people fill those in and then we present it in 60 minutes or 90 minutes depending on how much content they’ve got and we make an offer at the end. And if they don’t have a product, even better we just create a product on paper and then we sell it and if people buy then you deliver it. It’s just more webinars, something we talked about before, just sell more webinars. Yeah. Steve: Okay. And so you mentioned that you do these seminars across the world and you actually pick people from the audience and then just create a product from scratch. So what I was hoping to do today in this podcast is pretend that you are talking to me and I want to create some sort of product, but I have nothing. I don’t have an audience; I got nothing, so walk me through the process. Steve: Okay. Yes, so my target audience are people who want to create eCommerce stores. But let’s say I have no content, I got nothing. So what would you advise me? Essa: Yeah. Basically what I’ll do is I want to put together a webinar with you. That’s the first the step, no matter what. Whether someone is in your position or not I’ll just sit there and go, “Okay, first we need to choose on who is the target market, who are the people that we want to target.” We want to choose people who want to create an eCommerce store or they already have an eCommerce store and they want to monetize it more. They are making a million dollars from their eCommerce store. There are people over 60 who have got eCommerce stores, or what is that target market, what can we identify is the common denominator with all of them, out of all of those things I’ve just mentioned or if you can tell me who is the target market. Steve: Okay. So let’s– just for the sake of this example, lets beginners. Maybe people who want to start a family, so maybe they are in their early 30s; late 20s and they want to spend more time with their child so they want to start a business that they can kind of run from home. Essa: Okay great excellent. They going to spend less time with their kids if they work from home let me tell you. No, I’m just kidding. Okay, so how to make– and what’s the best– have you actually done this? Have you made money from eCommerce sites? Steve: Yes. So let’s say I have my own eCommerce site. Actually yeah, I have my own eCommerce site. Essa: Great, excellent. What’s the best result you’ve got in a month in sales? Steve: The first year that I launched it, I made six figures. Essa: Okay, great. So if you could give me an exact figure that would be better because the more exact we are with the titles, the better. So people– instead of saying like how to make a $100,000 a year thanks to eCommerce sites, the headline I’d want is something like, discover how to generate $171,000 in 12 months thanks to eCommerce. Essa: Okay. So that would be title of the webinar. Just grab any title for now, it will do and let’s work now. If haven’t got that result then you say, “Discover how to build a highly profitable eCommerce website in five easy steps.” So we’ve charged in the target market. We could even say something like, ‘Attention Beginners.’ So spend a bit of time on working out who is the target market and come out with that title of the presentation and then we want have– create the introduction of the webinar which is about 10 minutes of content. Any introduction on a webinar what you want to do is Steve is, number one when people come to your webinar you got to be quick to tell them what’s in it for them. They’ve registered, they’ve come to the webinar, you’ve got a couple of minutes at the beginning to really make them decide whether they’re going to pay attention to the webinar or if it’s a going be a webinar playing in the background like a radio. Because too many people these days they think, “I got 100 people to the webinar.” But you got to get them engaged, it’s not enough to have them there. You’ve done the hard work, now you’ve got to keep them there. So when the webinar starts, if you use GoToWebinar, there is a lady that says, “Broadcast has started. All attendees are in listen only mode.” Right? As soon as that hits, and you’re sharing your title of your presentations on the screen, you got to get– “Hi, welcome to the webinar. It’s Steven Chou here and today you are going to discover how to make $171,500 in five easy steps building an eCommerce website, okay? And today I am very excited because I’m going to show you how to retire with this strategy. I’m going to show you if you’ve been wanting to make more money, if you have been– I am going to show why eCommerce websites are the best thing out there since sliced bread and why you should use them and most importantly what to avoid when you’re doing them. Let’s get right into the content here. So put down any distractions, grab your pens and pad and this an interactive webinar, so make sure you’re taking lots of notes. I’ll be grabbing questions at the end, so let’s get into it.” Then I want to basically put in a slide. Who is this webinar best for? Who is this webinar for? And what I want to do there is I want to touch on all the different demographics that we have there, the different target audiences. This webinar is for you if you’re a husband or wife that you want to work from home to spend time with your kids more. You are looking to replace your income. Ecommerce website is perfect because they are easy, you can do this and na-na-na. It’s perfect for you. Steve: Okay. And in this period is– you said five to 10 minutes of this? Essa: Yeah. They still going with the five– we’re still in the first. These are some of the concepts within the first 10 minutes. Essa: These are things we want to touch on them. And then you want to get into the proof. So any proof– nothing sells like proof. So if you’ve got a screenshot or a bank account statement of you making that money, now black out all your banking details and stuff, just show the figure. All right, this is my bank account guys in 12 months, or this is my financial year review bank. This is 171,000, that’s my website. That’s what I did. Here is the front of the website, this is what it did, okay? Here is a client of mine, he did– like I’ve got– one of my clients is a vet. He made 300 grand and sold his business in 12 months thanks to webinars, created a website called thewebinarvet.com; people can go and check that out. They can hear his testimonial on YouTube if they don’t believe me, it’s there. Also he made over a million dollars, he sends me an email, I put that he sent me in there. I show people, I’ve got a pilot he made 450,000 pounds thanks to webinars. I’ve made $8,000,000 thanks to webinars. I show my PayPal account somewhere. But here is a webinar I ran last week. I want people to know that this is current. So I always update my testimonials as often as I can. Hey here is a– like I said to you at the start of the course. I just did 57 grand two weeks ago, last week I run a webinar, made a 100 grand selling 10, $10,000 products last week, right, to a boot camp we’re doing. So the more proof that you have the better, the easier it is to sell. If people don’t have proof Steve, they just got to find the statistics. So they say something like, look nine out of 10 ecommerce websites don’t make money according to the Bureau of Statistics website, and you quote the source and you say, “Here is why they don’t make money, because they don’t follow the five steps that I’m showing you here, or look at this guys one out of every 10 people who comes to a webinar buys, right, whereas one out of every 100 on a website.” So webinars are much better conversion and you could sell products that are 10 times more higher in price. How do we know? Because we’ve tested this over and over again. This outs our research or other people’s research, quote the source. Now it’s relating back to them, okay? Instead of me saying, yeah, my dad told me to get a job, and it’s panel beating, I’m relating it back to them. Then I say, but my dream was to play music and be in a band. Who has a dream or a goal but because of time or money, you can’t do that. All day your are day dreaming about doing what you love but you can’t because you got to be in a job because you don’t have enough money and people always say, “Yeah, yeah that’s me too, right?” So I told them I am a musician, I told them where I’ve come from, but I’ve related everything back to them. Then I say, “Then I got into real estate. Who’s invested in real estate, didn’t have enough cash flow before?” Yeah, absolutely that’s what happened to me. I realized I needed a business, so I started a webinar business and I made 10,000, 20,000, 100,000, and there is the proof, and that’s what I do is I teach people how to make money. Here I am today teaching people how to do this. So I give them my story of the important points that were turning points in my life but turning points that are going to relate back to the audience as well because that’s really what we want. People buy from people they know, like, and trust. If they say, “Ah! That’s like me. My parents told me that too.” Now they have an affinity with you, they have something in common with you and the more you create that– it’s like at the start while we said, “This webinar is for you if you are looking to retire or looking to spend time with your family.” We want people saying, “Yeah, that’s me. The more you get them saying, “Yeah, that’s me.” The more they feel understood. Steve: This is really good advice. I actually have this video as part of– incidentally I gave away a free six day mini course on how to start an online store and I started with an introductory video and I think I’m making some of the mistakes that you just mentioned. I basically tell my story, but I don’t probably do a good job of relating it back to the listener. So this is really good advice. Essa: Yeah, awesome. It works really good, it works really good. And it’s okay, because when I started out, that was my story but then I started thinking about it, “Okay, why am I telling– always ask yourself, why am I telling them this.” How does this relate to them? How can I relate this back to them? Whatever you say on a webinar, how can I relate this back to the audience? That’s what I always look to do. And that whole section what we just covered there is the first 10 minutes, okay? If you are on a 90 minute webinar, then you want to do that in 15 minutes. Essa: Okay? And then we get into the content, and the content is the bulk of the presentation, and the content is where many people make a mistake because they fail to deliver content. If you are not making sales on your webinar, one of the primary reasons could be you are not delivering enough content, you are not demonstrating enough information, you are not demonstrating your skills enough. And a lot of people have a problem with the content they’ve got because if I give away everything Steve, what’s the point? They are not going to buy from me. I said, “I challenge you to try and give away in the next 40 minutes as much information as you can. Everything you know about your topic, give it away in the next 40 minutes. So I challenge you to try, okay?”And there is no way you could do it, right? There is no way Steve you could give away everything you know about eCommerce websites in 40 minutes, is there? Steve: No, there is not. But there always is this thing in the back of my mind that you might be giving away too much, right? Imagine the value, look at these templates. Imagine if he just gives me that $50 million template or that ecommerce template that he’s created $171,000 with, you know he’s just explained it, right? He’s just explained it but imagine if I get my hands on that template, that’s going to be so much faster if I work with Steve. After 40 minutes I’ve learnt so much, imagine what I’ll learn in his course eight modules and the templates and the couching calls with him and all of that stuff. That’s what happens to people, but if you don’t demonstrate enough, and it’s a fine line, you don’t want to turn it into a lecture. So you wouldn’t want it– for example, you talking about eCommerce websites. In the five steps, you got to create three, five, or seven steps in the content, right? Three and five steps is the best, seven gets too much, right? Three or five steps to building a successful $171,000 per year eCommerce web business. What we want to do there is we don’t want to turn it into buy a domain name and here is how you buy a domain name. Go to Go Daddy then click there and then do that and then– and then what do you is go to the hosting and don’t use the $9.99 option, choose that option and then after that you’ve got that hosting. And then go to this website here, it’s called eCommerce themes. I go here and I buy the theme and then I go into choosing the theme, then choose the theme there and then I go– add this to the WP admin, WordPress thing, now if you don’t have WordPress then here is what you click on. You don’t want to turn it into like a — too much of a drill by a drill, step by step because you just don’t have enough time in 40 minutes and you are not completely– they aren’t convinced 100% they want to do this yet. So you want your steps, you want to give the fundamentals and a little bit of how to and some resources, but you can’t give them everything that’s in the course because you don’t have enough time to deliver it. So at the end of 40 minutes, we wouldn’t have even gone through the first couple of sections and then you’ve left out all of the other stuff like how to get the product, where to source the products from, where to do this– you got to give an overview of every step, but don’t be afraid to sink in a little bit on each one and say, “Here is a resource that can help you do that, like you can buy themes for eCommerce websites here for like $100. We have our own themes. Don’t be afraid to say we have our own themes, our proven templates that our students use available in our program. But hey guys, you could still go to a website likes this and buy it if you wanted to. There are some options for you or you can get them created, go to odesk.com and they’ll create, ask someone, look for a eCommerce expert. Just be careful of this and this when you do it that way and make sure– ask for the quote upfront. And you are there to help them as best as you can, you want to stir them in the right direction. The sale happens in that 40 minutes of content, that’s when the people who emerge– who say, “Wow! These awesome, I want more of this.” That’s what we want them to do. We want to whet their appetite, by the time we get to end of 40 minutes we’ve given them stories, we’ve illustrated, we’ve shared testimonials, case studies, people who’ve used that information. Here is how you do this; here is how you do that, here is what you do there, and then we recap that after 40 minutes. Steve: Okay, all right. Yeah, that’s good stuff. So that accounts for 50 minutes. So you don’t sell anything until the very end, is that how you structure it? Essa: That’s right, yeah. The last 10 minutes now– there is a lot of people out there that will say, “Oh you got to start selling in the middle because people leave on your webinar.” That is BS, that’s total BS. Essa: And if you don’t keep people interested enough in your content, right, if you’ve done your job properly on your webinar, they are going to hang around till the end and they are going watch your webinar because they’re just genuinely interested. A percentage of people are like, “Wow! I mean– I don’t even know what it is yet, but I mean I want to work with Steve.” They’ve made up their mind. They’ll come up to you later and they’ll say to you, “You know what Steve, I really resonated with your story about what you said about your mum and how you want– how you’ve got a kid and you’re retired, you know, you tried to do this for your kid. I like you, I resonated with you, and I really see how this works. I see how you made the money, and I see how that works, and I really want to do this, and I want you to help me because you sound like a really, really good person.” They’ve already made up their mind. If you think back to when you’ve bought something especially on a webinar you’ve made up your mind that you want to work with that person or you know that their information is going to be good in that book or the course that they are going to run. You’ve already made up your mind. It’s just about now; they have to give us an irresistible offer. Like one of my favorite movies, the God Father, “I’ll make him offer he can’t refuse.” You know what I mean? You got to make them an offer they can’t refuse. And how do you do that? You stack the value. Now nothing– people give you money if you give them value, okay? And what I teach people in the close of your webinar, first before you close, you recap everything. You say, “Here is what we covered. Here is proof, I showed you how to do it, right? Step one was this, step two was this, step three was this, step four, step five was that.” That’s the recap. And then you need a transition slide because Brian Tracy, one of the best salesman in the world and a sales trainer– he says, “The sales section is the bumpy part in the whole process when you are giving a sales pitch, when you are giving a sales talk or something like that, when you are asking for the order that’s when the hardest part is for most people, right? Essa: It just becomes like, have they mastered building an eCommerce website, right? Essa: And you say, “Here is the program.” And if you don’t have a product right now Steve, it’s perfect because here is what I do. I tell my students put together eight, 10 or four, eight or 10 more webinars and also we need– is the topics that you are going to cover. So you to say people, “Okay, what’s the guaranteed formula to make all these happen the fast and easy way? Introducing our eCommerce Mastery program. And then I say, “Webinar one, we are going to cover researching and market to look out what’s the best market and in this webinar we’ll talk about X, Y, Z, this and this and this. And the benefit of that is blah-blah-blah.” Now here is the biggest mistake people make Steve when they are doing it close on a webinar, they start talking about the features. “Let me tell everyone listening right now, no one wants to work with you one on one, no one wants to watch your DVDs, no one wants to watch your webinars, no one wants email support from you, no one wants anything from you. They want the result of what that product or that one on one coaching call will do.” And people fail to close highly when they fail to tell the benefit of each of the features that they have. So instead of saying, “You are going to get this webinar which shows you how to research and in webinar two, you are going to get a webinar which shows you how to pick the best domain. In webinar three, you are going to learn how to get the best hosting and webinar four, you are going to learn how to get white label products and webinar five– instead of saying that you say, “Webinar one, we are going to show how to market research. In this webinar we’ll look at the best markets to go into so that you make the most amount of money, so that you are starting off in a profitable niche. This is what gives you the best chance of making more money so you can retire sooner, so that it’s less headache to manage, so that you get to spend more time with your kids, you get to spend more time on things you want to do and that’s really what you want, isn’t it? Steve: Okay. So instead of going over what your course offers, you just emphasize the benefits to the person who signs up for that particular webinar. Essa: I say 30% features, 70% benefits. So if you say you get this DVD set which is a weekend workshop with me and we show you– we basically go through the whole process, it’s amazing, it’s awesome, it’s blah-blah-blah, that’s 30%. The rest is you are going to learn how to build the business faster, you are going to go– you are going to be able to do it in two hours a week, you are going to be able to retire sooner, you are going to be able to have more cash flow, spend time with your kids, you are going to be able to buy properties with one cheque, you are going to be able to run a webinar, you are going to make money, enough money from that webinar to put a deposit on a house. How good is that going to feel? That’s what we teach in that webinar. Essa: You know what I mean. Instead of saying we show you how to put together an introduction, a middle and close, and how to put a product together, they don’t care about all that. They want the end result, so you got to remind them and don’t be afraid. If you know your target audience wants to retire and you’ve got a whole bunch of people on your webinar and they want to retire, quit their job and spend time with their family, don’t be afraid to say that 10 times in the close. Remember guys when you do this, when you setup a eCommerce website the right way, you are going to be able to retire, spend time with your family. When was the last time you took your family on a holiday? You are going to be able to do this when you set it out and you can manage your eCommerce website when you are on holidays if you need to in just one hour. You can have the sales coming in, you make the money while you sleep, you wake up, you check your sales, you add a couple of extra products on it, you spend the rest of the day with your kids. Paint that picture of what life is going to be like after they own your product. Essa: That’s right, yes. If you didn’t have a product right now I would create, get you to create some more webinars, right? So four, eight, 10, or 12 over one per week. So you can run them live each week and you only have to record them the first time and customers will be really happy because they get to speak to you more. They get to ask questions and the good thing about creating your course this way Steve is that basically you can fix it on the go. If you notice that your customers are too– falling behind and they are not keeping up with you and you are going too fast, you can basically– you can change it, you can change the course midstream and add in there an extra webinar or add in there speed it up or slow it down or add some more resources in there. If people rush out and they write a book and then they go and build a course and then they try and sell it when they haven’t got any feedback from anyone, it’s the worst thing you can do. You are not going to create a good product. How do you create a good product? You market research, but you get people to pay for the market research by selling them the webinar series on the course, on the free webinar. You sell them the series and now you have people paying for market research and you are trying to make them successful as best you can so get testimonials for next time. Steve: How much do you charge? Essa: Depends on the product, you know, it’s like– normally for a little of your product normally something like you are offering there. For eight webinars, $297 is a good price point to start off with. Essa: And what I want to do is I want to make them as successful as possible. So the first lot of customers that I have, I want to call them up. I’ll call them up. Say we get 10 or 20 people signed up, I want the business owner who we’re starting a business with to call them up and say, “Why did you buy? What made you buy our course?” And they are going tell us. Those 20 people are going to tell us why they bought and that’s good information for the next free webinar we run. And then I’m going to say, “What’s your idea, what’s your topic, blah-blah-blah,” and I’m going to help them become successful because I want testimonials. Nothing sells like proof. If you can help people do what you are saying and you get a testimonial that helps sell more on the next time you run it, right? And it helps them talk to other people and it’s what your product should be doing, your product should be getting results. Like I think my webinar costs– gets more results for people than any other internet marketing product that I know, and it’s more real results, because putting a webinar together works. When you do it the way we teach, it works and that’s why we have so many successful students. So to me in a business, results is everything. We want to get– whatever we’ve got to do, bend over backwards to help that first bunch of customers get the result, that’s going to help us put the price up, it’s going to help us to add more value to it, get testimonials, sell more of them later on. And if you are selling more than one in 10 at $297 put the price up to $497, then $997, 2000 and that’s how I started. I started with a $300 product and now I sell a $50,000 product but my average product on a webinar I sell it $3000. I don’t have a product cheaper than that except my webinar replace offer which is $497, but I don’t sell that on a webinar. I just got a website for that, we don’t spend too much time focusing on that. We sell our $3000 webinar training and that sells by itself on autopilot. Steve: Through your webinar replay. Essa: Yes, through our webinar replay, exactly, yeah. Steve: Okay. So let’s go over something else. So let’s say you’ve got the presentation. How do you actually get people to sign up for your webinar? Essa: Yeah, absolutely. There is many, many ways. We cover a lot of information on how to do that. It’s the biggest question we get, but I’ll give you two easy ways that you can do that, right? The first one is joint ventures. First thing you need to do is start building your own list. If you are in online marketing, then you need to start building your list, right? And if you don’t have a GetResponse or AWeber or Infusionsoft or one shopping cart, MailChimp, you know accounts to capture names and email, that’s the first thing you need to be doing. You need to be capturing names and email addresses yourself, and every opportunity you want to capture names and email addresses at every opportunity. At my event I actually show people how each person who comes to your webinar is worth $70 when you follow our sort of model of creating products at $300, then in $2000 and $10000, but we don’t have time to do it here, but basically each person who attends your webinar is worth a dollar amount if you are selling products and stuff. So you have to realize that building your own list is number one, critical and something you have to do every day. But the number one way to fill a webinar is to find people like me who’ve got $25,000 subscribers or more and ask them to mail to their list for you, for your webinar and give them a percentage of the profit if you make a sale. Essa: Yeah. It’s what I do every week, right? I either promote other people on my webinars and they sell, like I had a guy last night. Last night we run a webinar on Amazon. The guy made three sales so far at $500, right? We had like 80 people there. So conversion rate was a little bit lower than what we’d expect. He wasn’t a student of mine, he was just a guy I met at an event and he interviewed me and I said, “Okay, I’ll do a promotion for you for a 50-50 deal.” And I’m sure the webinar replay has already made sales. If I check now in Infusionsoft I’m sure there is more sales coming from the replay, but basically find someone who has got a list, who will mail for you for a percentage of the sales because they can make you rich. Three or four guys like me can make you enough sales if you’ve got the right target audience, the right product, the right price; you make it irresistible, you’ll close 10%. And if I can get 500 people registered for webinar I can get at least 200 to 300 showing up to watch it and then the rest of them on the replay. If you can close 10% of those, that’s 30, 40 sales at 300 or even $500 or a $1000, that’s 30, 40 grand. You are giving half away but– then you get other products and services for a higher price to those people who bought at the end of your eight weeks or 12 weeks course, you should offer a done for your service for 10 grand. Essa: All of that and that’s a 100% profit for you as well. So what I do is I spend 15 minutes or I tell people to spend 15 minutes every day looking for joint venture partners, create a spreadsheet and have your assistant email potential joint venture partners and keep chasing them up until you get them because a couple of those, we’ll make you a seven figure business quite easily. Steve: So you mentioned the typical conversion rate for a well done webinar is on the order of 10% of the attendees, is that what you said? Essa: That’s right. Yeah, that’s right. Steve: Okay. And then do you use any sort of paid advertising like Facebook, adwords and that sort of thing typically? Essa: Absolutely. We totally do but I tell you now, if I lost everything tomorrow, if I lost everything and I had to start from scratch, I wouldn’t be starting off with Facebook ads because it’s so much harder and more expensive to do. And you can lose– what I always tell people is I’ve spent three grand on Facebook ads and made 30 grand, you know, I’ve made money with Facebook ads, but they are coming harder and harder to get them right. And if you are a beginner, it’s very-very hard. If you hire someone to do it for you then great, but what you really– what the best use for your time is finding that JV partner because there is someone out there that needs more content for their database. When I do a JV webinar for someone like I did last night, the Amazon one, the guy delivered so much great information from me. Now, if I didn’t give that information to my 25000 people as option for them to sign up for that webinar, someone else will email them a webinar about kindle. You know what I mean? They’ll end up on someone else’s list. Now why wouldn’t I want them to number one, make sure that the expert I’ve got– he is a good expert. He’s been doing it, he showed me proof how he is making money, 15 grand a month thanks to kindle. Why wouldn’t I want to put him through my list to my subscribers, it helps him. If he makes sales, he gets 50%, I get 50%, and my list gets great information. Even if they don’t buy they’ve gotten a resource, a great expert that they could reach out to, they could get help from if they want to buy the course later, or at least they know about it, and the webinar went for two hours and he was answering every question they had at the end. So it’s another way– people say, “Why would someone want to promote me for that exact reason?” they are looking to promote more stuff to their list, they’ve got a list, they’ve got nothing else sell. The list– most of your list won’t buy product, so why wouldn’t you offer other people’s product to sell, right? So I could launch your webinar Steve, how to make a $171,000 a year thanks to eCommerce websites because I don’t have an eCommerce website, and most of the people in my list I think– there is only about three and half, 4000 of the people out of 25000 have bought something. The rest are just on the list for information or their email addresses are bad or whatever it is. On your database there is only a certain number of active people and if you are not offering them something, they are buying stuff from other people. So why don’t you filter that and make a cut and bring the best experts to them? Steve: Okay. So let’s take a step back and also talk about some of the tools that you use. So for example, webinar software, what do you use? Essa: Webinar software, I just use GoToWebinar. I’ve got the same account that I setup in 2008. I think it’s $79 a month now for 100 people and people say, “Oh, but 100 people. That’s all you can have.” Well if you got a 100 people coming to your webinar, you can always upgrade it, but if you’ve got 100 people coming to your webinar every week then you are making way more than $79 a month unless you are doing something wrong. Steve: Okay. And then in terms of collecting the email addresses for go to, do you use anything? You use Infusionsoft I thought I had you mention. Essa: We’ve got five businesses and across those we’ve got one shopping cart, we’ve got two one shopping cart accounts, three Infusionsofts and our students– we teach them how to setup GetResponse because it’s 15 bucks a month, it’s cheap and you don’t need something so– as heavy as Infusionsoft when you are starting out. It’s a bit overwhelming for people and you don’t have a business yet. So spend $200, $300 is a bit of a stretch for some people, so GetResponse or AWeber will do the job for you for 15, 20 bucks a month. GoToWebinar as well, 100 bucks a month or whatever and yeah, those are two main softwares that you need to collect names and emails and run webinars. We also have another tool we use LeadPages, which integrates really nice leads through those, so when people register for GoToWebinar, when you’ve set it up in LeadPages they automatically sign up to your AWeber account or your GetResponse account and the GoToWebinar at the same time. So that’s a really cool tool, Leadpages.net. These guys in the states made that. They are really-really clever, so that’s a good software to have. Steve: What about Google Hangouts, have you ever tried running a webinar through hangouts? Essa: Yeah. We’ve run webinars through Hangouts before and the software– first you need other software to actually capture names and emails for it, and secondly I don’t know about in the states but the internet speeds in Australia aren’t quite at that level yet where– you know, it’s a bit more laggy, it’s a bit more not as good quality, and at the end of the day I just didn’t have as much success with it and I didn’t find it as easy to use as GoToWebinar. Essa: But it’s a free software, Google Hangouts it works, whatever just choose the platform and roll with it and you’ll just become professional at that. On GoToWebinar and Google Hangouts you are going always have people on your webinar that have technical problems, okay? You are going to have a percentage of people that have a technical issue on their side; there is nothing you can do about it. You just got to send them a replay later. So I get people typing in questions, “I can’t see, I can’t see anything,” I say, “Don’t worry, I’ll send you a reply later.” And then they just go away and they don’t have to stress out anymore and they can watch the replay the next day. Steve: Okay. And in terms of support, do you provide support to all the people who watch your webinars? Essa: When they are watching a webinar– do you mean after they bought the products? Steve: I mean after– yeah let’s say they bought the product. Yeah, let’s say they bought the product, yeah. Essa: Yeah if they buy the product, yeah. We– it depends on the package. I mean, if you want to you can add support. Our $3000 program has email support; it also has a weekly group webinar which one of my head trainers runs. So they can get on a call every week and ask questions and interact with my head trainer, which she also allows them to present as well so they can get a student feedback and stuff like that, but that’s for $3000. So it’s got to make sense financially, but if you are just starting out and you don’t have any money coming in, give away the whole house, give away everything for free as part of the package and then you put your price up when you are getting people successful. Because remember, once your calendar is full then you start putting the price up. I get a lot of people when I put the webinar to give and I say, “Throw in there some Skype sessions, throw in there email support and sell it for $297.” And they resist then I say, “Would you rather be busy and making a little bit of money or would you rather be not busy and not making any money?” You know what I mean? Steve: That’s a lot of sense. Steve: So when does the actual website come into play? Do you always just do the webinars, but do you ever put that stuff on a website, like a membership site or is it always just webinars? Essa: Yeah, absolutely. We’ve got a– we just build a membership site through WishList, WordPress. Wishlistmember.com I think they have a $97 plug-in and you plug it into WordPress. There is other sites out there like Kajabi.com and OptimizePress which is WordPress again, but you can basically build your own membership site or have someone build it for you for about $1000. Then you store those replay webinars that people paid for– you put them in there and you give them access to the membership. You can charge them a fee but I recommend you just let them access the course they paid for because they’ve already paid for it for free. You can setup multiple levels and stuff like that, yeah. But we don’t spend a cent on that until we’ve made money, so we are only reinvesting money. It doesn’t make sense to spend stuff that you haven’t made on the business yet. So you got to reinvest a percentage of the money you’ve made into a membership site so that people can watch it after. Essa: You are doing it. Steve: I’m doing it this way, but I thought it was very unconventional when I did it this way. Like, I launched without any content pretty much and I just kind of had buyers with the promise of content and then once I got these buyers, I started putting out the content. The only difference is I was doing it live to just a small set of people in the beginning. I wasn’t doing a whole bunch of webinars, but it sounds like your strategy would work a lot of better to expand and convert more people so. Essa: It definitely works some. People say, “But Steve, doesn’t some people get upset that there is nothing there yet?” I know I always ask the audience. I always say, “Don’t ask me, ask the audience.” I say, “Who in the room here, who in this seminar room if I was selling a eight week webinar course for whatever price, $497 or whatever, who would rather watch the replay videos of those modules? Who would rather– put your hand up if you would rather watch the replay modules, or if you would rather me present that live to you each week where you can ask me questions at the end of each webinar. Who would rather the replays, the video only? And always one or two people put their hand up but when I say, “Who would rather watch it live with me each week, and then I give you a copy of the replay if you can’t make it or if you want to watch it again?” And all the audience put their hand up. The audience wants to speak to a human being. This online that you can automate everything and whatever; they still want to be able to speak to a human being. They always prefer that over a video. Now they’ll take a video second, all right, they’ll take a video second. So if you can show me how to build a eCommerce website in a video tutorial series that you’ve created, I’ll take it, but if you give me a choice then I can talk to Steve on the call each week and he’s going to run me through that eCommerce thing and I can put my hand up and ask a question and I get the replays, they are always going to take that option. So never be afraid to sell something that you haven’t created yet, just make sure you’ve got it created and it’s easy. You just got to be one week ahead over the course or the modules. Now if you go halfway through and you go, “Guess what, I can probably create all the rest of them.” Create all the rest of them and send it to the customers and say, “Hey, I just created it all. If you’ve got any questions, email me. I’ll jump on a Skype call with you if you need to and whatever we are going to do to make you successful.” So it’s totally okay. Steve: That is really great advice Steven. Hey man, I want to be respectful of your time. We’ve already been talking for 50 minutes, so just in enclosing where can people find more information about your webinar training classes? Essa: Yeah, absolutely man. Well we finished the– I think we’ve finished the web business boot camp for this year, the tour. We did a world tour, my wife and I finished with that, but usually webbusinessbreakthrough.com is where we pull random attendees out of crowds and we did it all over world, but Steveessa.com just S-T-E-V-E-E-S-S-A.com– Steveessa.com is where you can check out my webinar where I talk about– I do a demonstration actually. I pick someone on the webinar, do a webinar with them, and quickly show you how to automate the webinar, show you how to record and I also talk about the medicals and the module nuts, setting up webinars for other people and taking 50% of the company. And that’s– I’ve got one company that’s done like over $2 million now in three years, and I own half of that and that business partner has done 120 grand on a webinar with 13 people on there, and I make half of that and I’m not even there. Essa: It’s a hugely powerful model. I call it the Medical center model where you get experts working for you. So in a medical center the model, the medical center owner is a smart one because he’s got the leverage, right? The doctors sort of pay a percentage, or pay a fee to him and her and they don’t have to go to work every day. So I’ll show you how to create a medical center model that you can make sales from. Steve: Okay. And this is where you are sending them traffic from your list or is it just– how is this structured? What is your value add? Essa: Yeah. Check out the webinar and you’ll see. Steve: Okay, yeah. I’ll link up to it, I’ll link up to it. Essa: It’s another podcast for you. Essa: There is many ways to do that. I don’t mean to be like avoiding, but there is many ways to do that. You can basically– a lot of businesses have lists already, but if they don’t you can yes absolutely set that up for your list, anything that you’ve got or you can go out and find JV partners for them, and make a cut of that, yeah. Steve: Okay. All right, cool. I’ll link up all those resources in the show notes, and hey thanks a lot of coming on the show Steven. I really appreciate it. Essa: It was my pleasure Steve. I hope people get value out of it and I hope more importantly you go out there and take action and get results. Steve: I hope you enjoyed that episode. After talking with Steven, I actually went back and re-recorded all of my sales videos for my six day mini course, and I’m actually seeing the results and his techniques actually work. For more information about this episode go to Myquitherjob.com/episode58, and if you enjoyed this episode please go to iTunes and leave me a review. When you write me a review it not always make me feel proud, but it helps keep this podcast up in the ranks so other people can use this information, find the show more easily, and get awesome business advice for my guests. It’s also the best way to support the show and please tell your friends, because the greatest complement that you can give me is to provide a referral to someone else either in person or to share it on the web. Now as an added incentive I’m always giving away free business consults to one lucky winner every single month. For more information go to Mywifequitherjob.com/contest, and if you are interested in starting your own online business be sure to sign up for my six day mini course where I show you how my wife and I managed to make over 100K in profit in our first year of business. Go to www.mywifequitherjob.com for more information and thanks for listening.